Feature branching is a concept that is used in most software development environments. If you’re working in .Net, Java, Python, Go, Node.js or Ruby you are likely familiar with the concept. Instead of making changes to the code base directly, you can branch off from the mainline and work on a specific feature in an isolated branch. This allows multiple people to work safely on the same code base in parallel. Atlassian recommends it in their Git flow for Salesforce guide. Wait, Isn’t This What Sandboxes Are For? Salesforce promotes a similar but different concept with their sandbox offering: instead of making changes in production, make them on a sandbox first. Then merge the code changes back into production only when ready. This is a great concept but it doesn’t quite solve the same problems as feature branching. Faster, simpler deployments are the key to feature branching in Salesforce. First, sandboxes tend to be staging environments rather than isolated units of work. On a sandbox there maybe dozens of features going on at any given time. And there may be multiple developers making changes to the same code base causing code clobbering and related havoc. We have seen sandboxes that have not been synced with production in over a year. So the dependencies between sandbox and production are likely to be out of sync making merging difficult. Feature branching takes the sandbox concept to a whole new level. 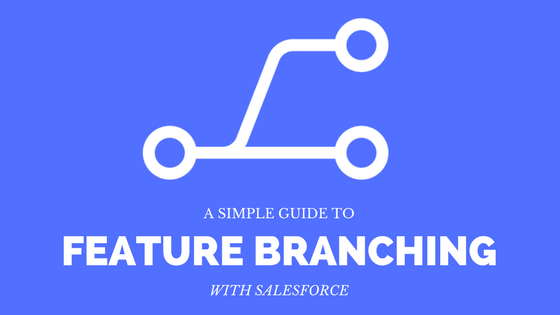 This blog post will provide a more in depth look at why your team should be actively using feature branching for Salesforce and how to do it. Developers can experiment with features without disturbing the main code base. Different features can be treated as different bits of work and released on their own schedule. Your mainline branch never contains broken code and is always deployable meaning you can ship more frequently. This makes end users happier instead of large sweeping changes. Also, it makes deployments much faster. Your development branch is never too different from the mainline branch because you are doing small independent units of work, making merging much simpler. Imagine a sandbox that has been newly created. You make a few changes on the sandbox and then deploy a changeset that afternoon. It’s likely to go smoothly because there wasn’t enough time for dependency differences to build up between your sandbox and production. Feature branching allows the same concept. Feature branching also makes the concept of Pull Requests or Deployment Requests possible. This encourages code reviews for Salesforce and discussion about particular changes before doing deployments. This is helpful for all members of a Salesforce development team who are overworked already. This moves you to the master branch and pulls any changes from master that are on the origin remote. origin is the name of your Git remote repository. my-feature is the name that you want to give the branch that you are going to create on that remote. Generally, you want to use the exact same name that you have used locally to avoid confusion. Then, if you are using Bitbucket, GitHub, or Gitlab you can use their pull request technology and open a new pull request. They have tools for code reviewing and merging through their user interfaces. Feature branching has been historically difficult for Salesforce. For one, very few teams are using Git at all. And feature branching requires some Git expertise and command line familiarity. Salesforce developers may have no problem with this, but when a project includes, consultants, admins, product managers, project managers, business analysts and others, it becomes difficult to expect everyone to master Git from the command line. Most teams are using sandboxes as a kind of semi-feature branch. However, Sandboxes are slow to spin up and cumbersome. Deploying with change sets or Ant scripts are difficult. This makes the merging of a feature branch back into the mainline tedious. No one wants to do this too often so teams are settling for monolithic changes and releases that span weeks or months. Furthermore, it is not uncommon to have your Git code and your production code reflect different truths. Often times something that is pushed to Git is not deployable to production because of dependency issues. Because teams are having multiple users develop and configure on a single sandbox, merge conflicts come up frequently and are not easily dealt with. Blue Canvas makes feature branching much simpler for Salesforce developers. In four clicks, you can tie a branch in Git to an org without ever touching the command line. 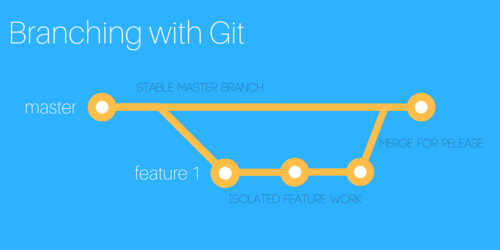 All changes on that branch are automatically committed into Git. You can issue pull requests from the Blue Canvas UI which allows for code reviews and code merging if the review is accepted. Not only does Blue Canvas help with the branching, it helps deployments. And faster, simpler deployments are the key to feature branching in Salesforce. If you can deploy selective components quickly it makes more sense to treat each new feature as its own branch. We even just released branch deletion so you can wrap up a branch when you are done. Salesforce DX makes feature branching for Salesforce even more possible. DX introduces the concept of scratch orgs. Scratch orgs are sandboxes that can be spun up in minutes rather than hours or days. They persist for only about a week and so are perfect candidates for feature branching. Blue Canvas is developing new technology to make feature branching with scratch orgs easier and more accessible without using the command line. With Blue Canvas you can spin up a scratch org from the UI, and it gets automatically tied to a branch. 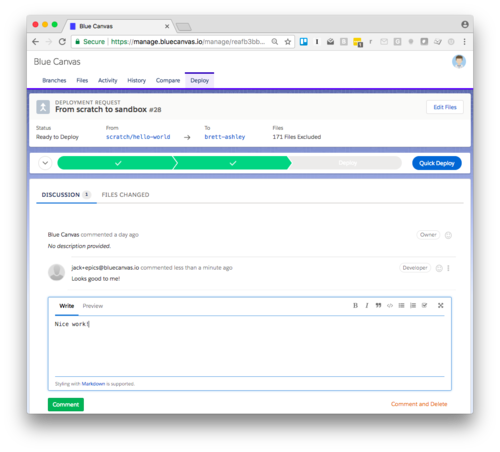 If you want to check out feature branching with Salesforce DX and Blue Canvas, email team@bluecanvas.io to setup a trial. How Blue Canvas enables feature branches with our Virtual Packaging concept. How you can leverage Blue Canvas CI to run automated tests in the cloud with Provar Testing. What makes the Blue Canvas platform unique in the Salesforce release management landscape. © 2019 BLUE CANVAS LABS INC.